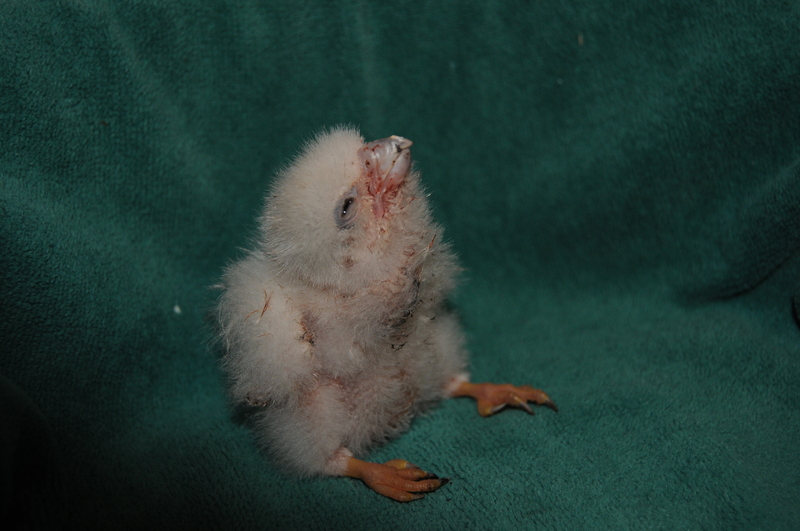 Peregrine chicks cleared for flight in Wilmington, Del. 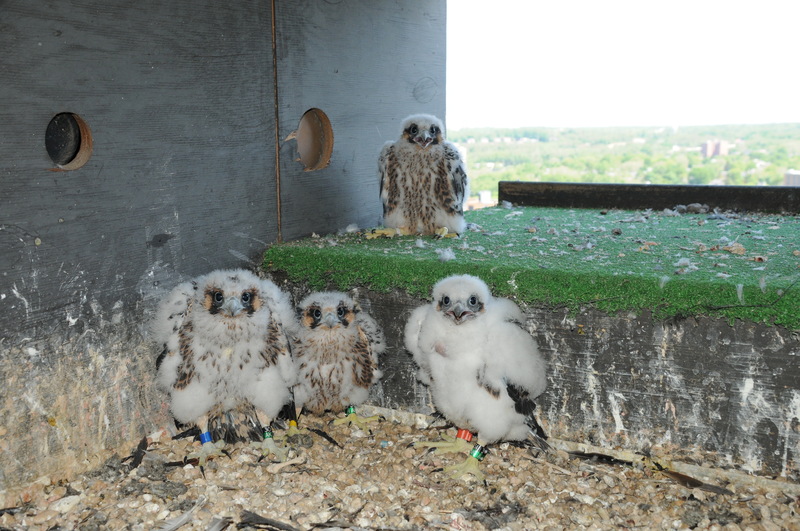 The peregrine falcon chicks on the 19th floor of the Brandywine Building in Wilmington, Del. The camera is sponsored by the Delaware Ornithological Society and DuPont’s Clear Into the Future initiative. Credit: Craig Koppie/USFWS. This Tuesday, the four peregrine falcon chicks on the 19th floor of the Brandywine Building in Wilmington, Del., got a little bling of their own – colorful leg bands that will further knowledge about the regional peregrine population. U.S. Fish and Wildlife Service raptor biologist Craig Koppie gave the chicks their bands to help gather data from the falcons as they spread their wings into adulthood. Craig has kept a watchful eye on these chicks since they hatched, and his efforts helped ensure that all four survived. Back in April, the first three eggs hatched together on the same day. Three days later, the fourth hatched, leaving a smaller, virtually helpless chick. It had little chance to compete with its larger siblings and a low chance of survival. Craig was authorized by the Delaware Division of Fish and Wildlife (under the Department of Natural Resources and Environmental Control) to make an emergency intercession. He removed the chick from the nest, nurtured it for two weeks until it had a fighting appetite for life and reached a size comparable to that of its siblings. U.S. 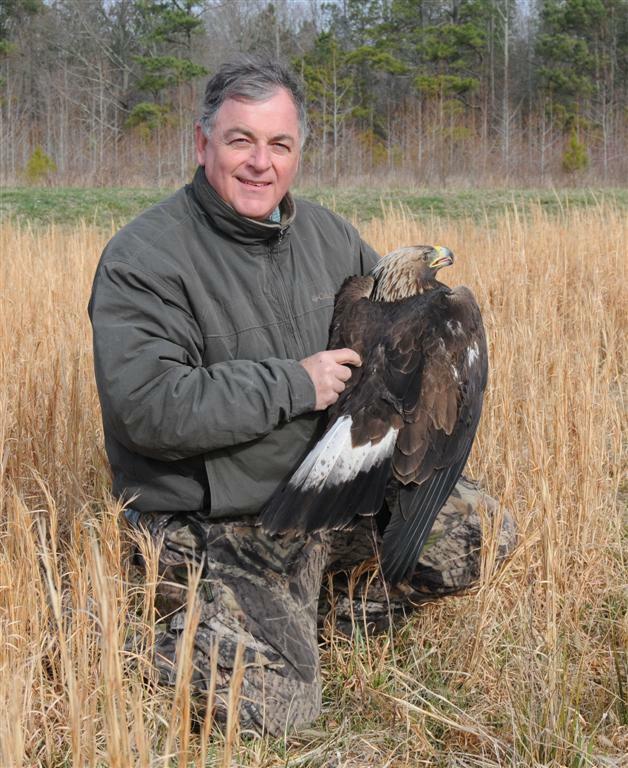 Fish and Wildlife Service raptor biologist Craig Koppie with a captured golden eagle. Photo courtesy of Kennon Smith. Upon the chick’s return to the nest box, the mother – affectionately known as “Red Girl” to Falcon Cam devotees – brought in a small bird and fed the other siblings until the very last piece, which she gave to the little one, his first piece of food from his mother since he hatched. About an hour and half later, Red Girl came in with a pigeon. “The young male forced his way to the front and was fed by the mother until his crop was full,” Craig says. When Craig came to band the chicks Tuesday, all four from the “class of 2013” were found to be thriving. 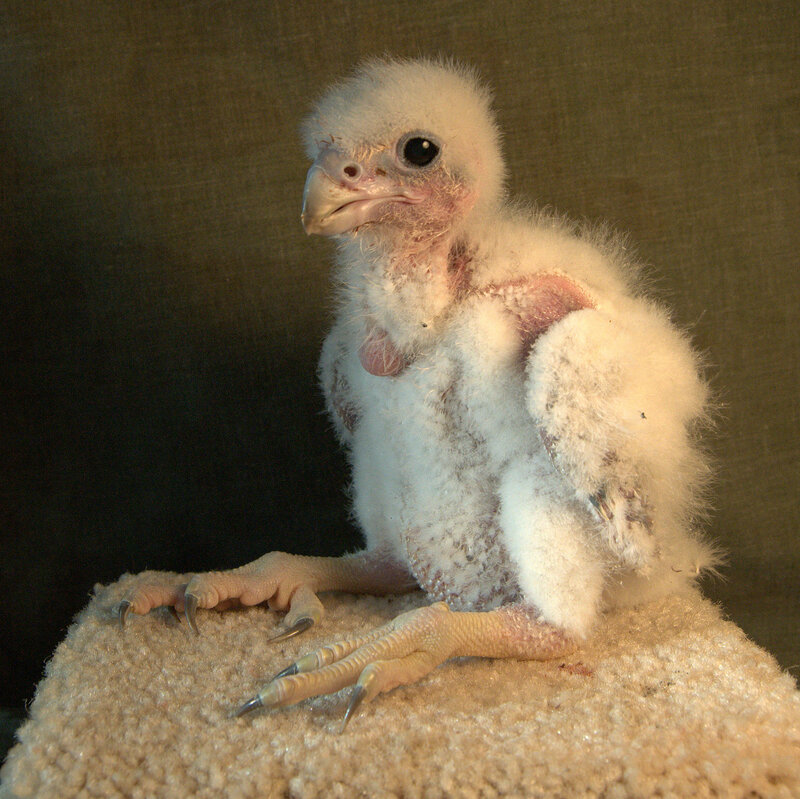 “The peregrine chicks usually stay on the ledge until around 6 weeks,” he says. Did you hear about the Cooper’s hawk rescued from the Library of Congress in 2011? Craig was in on that, too! The males are expected to exit first since they develop more quickly. When that happens, they’ll fly off with a little colorful reminder of where they came from. Resightings of the “class of 2013” will add to a growing database with valuable information on falcon movements, ancestry and adaptability to changing environments. This entry was posted in Blog entries, Migratory birds, Partnerships and tagged bird banding, brandywine building, conservation, craig koppie, Delaware, falcon, fish and wildlife, hawk, leg bands, Migratory birds, peregrine falcon, photography, red girl, usfws, wildlife, wilmington on May 16, 2013 by usfwsnortheastblog.